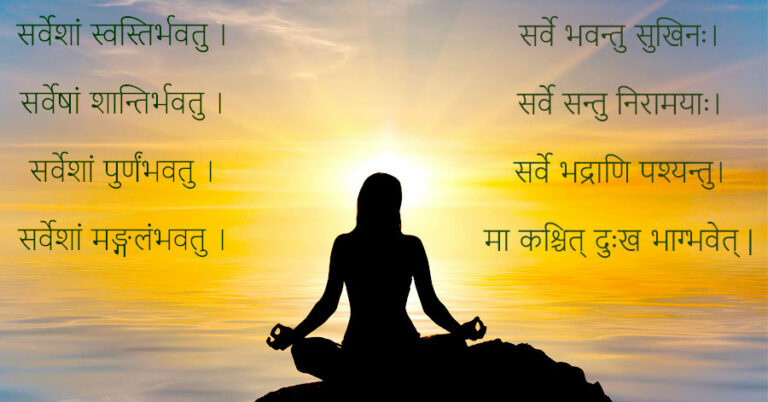 The peace mantra Sarvesham Svastir Bhavatu (सर्वेशां स्वस्तिर्भवतु) has been derived from the old scriptures of Hinduism – Brihadaranyaka Upanishad. Chanting of this mantra generates and sends healing vibrations in the surrounding and benefits all, who come into contact with it. This Shanti Mantra is a prayer for the peace and well-being of all living beings. By the chanting of this Mantra, obstacles and hindrances are believed to be pacified. The “sarveshamSarvesham Svastir Bhavatu mantra” is peace mantra that invokes harmony and tranquility within the environment in which its chanting is done. This Shanti mantra can be repeated either three times or eleven times.